Here is Chichi Factory Rescue's last recruit and not among the least ones... A Chihuahua completely terrified, with a heavy past behind him, though still very young. Removed from a puppy mill of Eastern Europe, he spent his life in a cage and was only used for breeding. 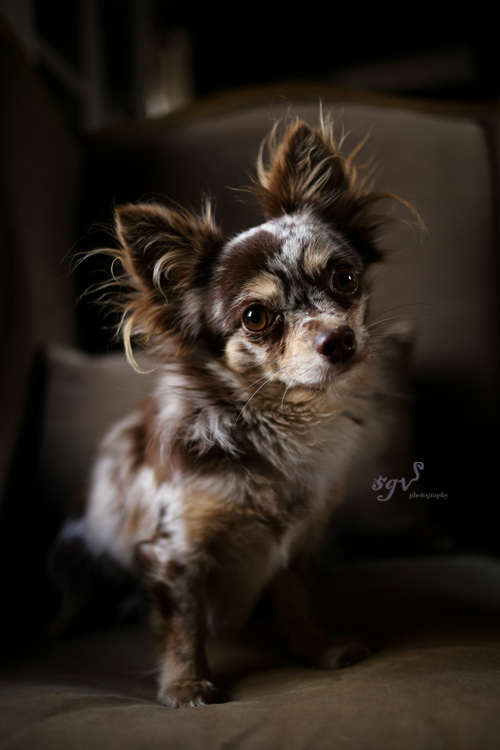 Saved from this hell and brought into France by SOS Chihuahua (a French organization), he was so terrorized in his foster home that he was growling and tried to bite, staying hidden under a bed, no way to approach him. A dog behaviorist gave a quite pessimist prognosis as to his chances of progress. So we offered to help this organization, who was looking for a solution for him, and he joined our team. Since then, he has started to trust a little, but his progression will take time. Puppy mills are crooked breeding facilities, where dogs are stocked in insalubrious kennels or pens, who are neglected and too often mistreated, who are only good for making puppies. They do not get any care, females generate pregnancy after pregnancy, even if they are not in good shape, without knowing anything else. Males, if they are not good studs, will regret not being productive enough... Then the puppies are sold over the internet or fraudulently transported to cities like Paris (if they don't die during the trip, stacked in cages, without any water and light), to end up in flashy window displays of animal shops, priced outrageously high! Behind all this masquerade, few people know the horrible fate of these dogs, hidden in the shade. Because the parents of these puppies, they stay in this hell until their last breath, in pain and misery. If you buy a puppy, you contribute to this shameful traffic! So please, don't shop, adopt! You will save lives.